Mercedes-Benz Vans has unveiled a revolutionary mobility concept in Denmark overnight which the company says goes way beyond existing ideas on autonomous vehicles. The Mercedes BenzVisionURBANETIC it claims eliminates the separation between people moving and goods transport, enables on-demand, sustainable and efficient movement of people and goods and applies an innovative approach to fulfil the needs of cities, diverse sectors of businesses as well as city dwellers and travellers. Benz Vans says the concept reduces traffic flows, relieves inner-city infrastructures and contributes to an improved quality of urban life. As part of a holistic system solution, the company says its Vision URBANETIC‘ addresses future urban challenges and offers innovative solutions. Itis based on a self-driving, electrically powered chassis that can take different switchable bodies for people moving or goods transport. As a ride-sharing vehicle, Vision URBANETIC can take different switchable bodies for people moving or goods transport. As a ride-sharing it can accommodate up to twelve passengers, while the cargo module can carry up to ten EPAL pallets. A load space 3.70 metres long fits into a total vehicle length of 5.14 metres. Plus, the concept incorporates an IT infrastructure that analyses in real time the supply and demand within a defined area. The result is a self-driving fleet, with routes planned flexibly and efficiently on the basis of current transportation needs. Thanks to full networking, the evaluation of local information – such as concerts and events – and intelligent control, the system not only analyses current needs, it can also learn from them. It is thus able to anticipate and react to future needs. This can optimise processes and help shorten waiting and delivery times and avoid traffic jams. For instance, the overall system can muse the data captured by the vehicle control centre – which collates and analyses needs – to identify a crowd of people gathering in a certain area. It can send vehicles there to quickly and efficiently satisfy the increased demand. The system can thus react flexibly and is not based on rigid routes or fixed timetables. Benz says it envisages transporting more people and goods with fewer vehicles on a virtually unchanged roads infrastructure in order to relieve inner cities and, at the same time, fulfil continually growing mobility requirements and customer desires. The company believes this would ultimately facilitate an improved quality of urban life – with flexible and comfortable movement of people, efficient and sustainable transportation of goods, significantly lower noise and pollutant emissions and greater freedom in city planning. Benz says the URBANETIC ’s electric drive delivers zero-local-emissionsmobility, making it ideal for city centres and are as subject to legal access restrictions. 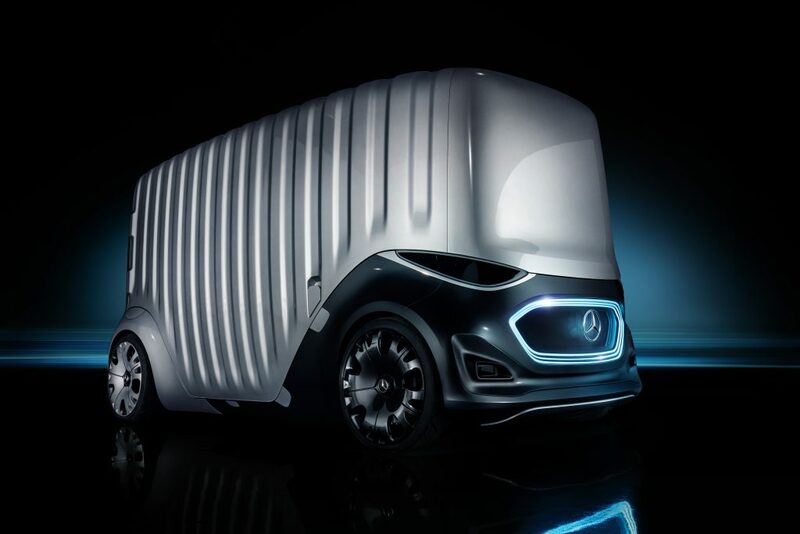 The virtually noiseless electric drive.Benz says also presents new options for late or night-time deliveries and thus offers major commercial potential. The company claims VisionURBANETIC adopts a new approach to overcome skepticism about autonomous vehicles, particularly with its people-mover body. The vehicle uses multiple cameras and sensor systems to observe its surroundings and communicates actively with them. It uses the large-format display on the front of the vehicle to inform pedestrians crossing the street in front of it that it has noticed them. Another highlight Benz says is digital shadowing around the side door.Several hundred light units display the contours of approaching individuals along the flanks, signalling to them that the Vision URBANETIC has noticed them.